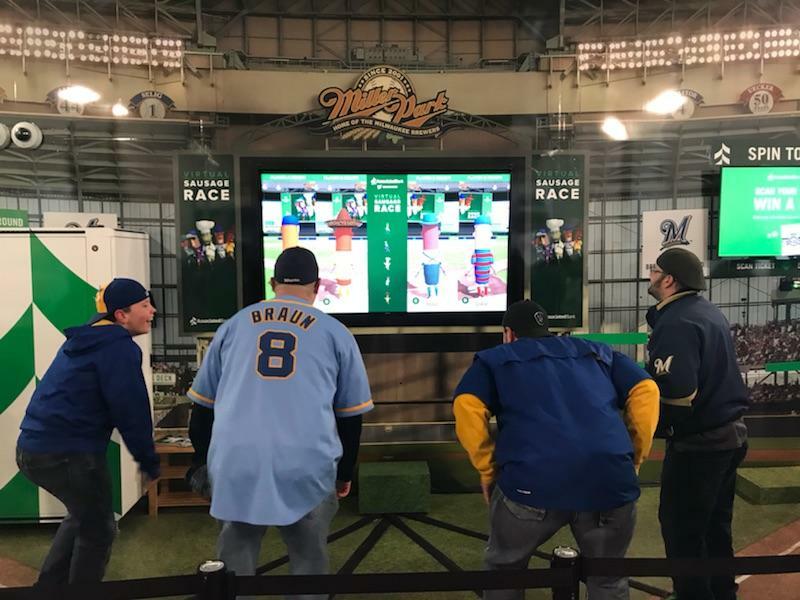 MILWAUKEE – April 5, 2018 – Associated Bank will once again partner with the Milwaukee Brewers to give fans the “Home Crew Advantage” through exclusive interactive activities in-stadium, online and in the community. New this year, as part of an enhanced Miller Park onsite experience, Associated Bank will be giving fans the opportunity to participate in our exclusive “virtual sausage race”. Fans will be able to pick their favorite Miller Park sausage character and race against their friends and family. In addition, all fans can scan their ticket to “spin to win” an assortment of prizes, including game tickets, Brewers branded premium items, Brewers sunglasses and more, all at the Associated Bank Experience located behind Section 113. Adding to the excitement, Associated Bank is proud to partner with WTMJ-AM/FM radio, home of the Milwaukee Brewers and Bob Uecker to sponsor the “Associated Bank Brewers Radio Network.” Uecker will voice 30-second radio spots as well as live reads during Brewers games throughout the season. Fans will have the opportunity to enter a Bob Uecker meet & greet sweepstakes later this season, complete with suite-level tickets and parking passes to attend that day’s game. Details around this and other sweepstakes will be promoted on Associated’s Facebook and Twitter pages later in the season. Taking place now through May 3, fans can enter the Associated Bank Brewers Ticket Sweepstakes for a chance to receive six tickets and two parking passes to attend an upcoming game from the exclusive Associated Bank Check Deck. Located in the outfield, the Associated Bank Check Deck provides fans an all-inclusive ballpark experience, complete with food, beverage and a unique view of the game and bullpen. For more information visit AssociatedBank.com/brewerstickets. Associated is committed to giving back through a variety of fun and interactive initiatives including supporting the work of nonprofit organizations that strengthen our communities. For the fourth consecutive year Associated Bank and Brewers Community Foundation are teaming up to support Housing Resources, Inc. (HRI) through the Hits for Homes program. For every Brewers hit recorded during home games, $150 will be donated to HRI, up to a total of $100,000. Each hit and corresponding donation will be tallied on the Associated Bank LED board, located above the Associated Bank Check Deck. Donations to HRI will be used to provide emergency and essential home-repair grants to low-to moderate-income homeowners in the counties HRI serves. To further support the community and again in partnership with Brewers Community Foundation, Associated Bank will host the popular Stock the BoxTM tool drive on Father’s Day, June 17 to collect new or gently-used tools for HRI. The event will be held at Miller Park with multiple donation points at the Check-In gate and throughout the stadium. For each tool donated, fans will receive a free Loge Level ticket (up to a maximum of eight tickets per person) for a future Brewers home game. Associated Bank’s business partners will also benefit from the Home Crew Advantage through exclusive events and experiences including behind-the-scenes batting practices and access to the Associated Bank Check Deck. Brewers fans can open a new Brewers™ Checking account and complete qualifying transactions to receive $1751. By opening a Money Market account ($1002) and Brewers VISA® Bonus Rewards Credit Card ($253) they can score up to $300. By opening a Brewers Checking account or Brewers Credit Card, fans can receive exclusive Miller Park benefits including a year-round 10% discount4 at the Brewers Team Store by Majestic™, access to the Associated Bank Check-In Gate4 and 2-for-1 ticket offers for select games5, and so much more. For more information, visit AssociatedBank.com/Brewers. 1. Offer limited to qualifying checking accounts opened before December 31, 2018. Minimum deposit required to open is $100. Deposits from existing accounts do not qualify. Customer must complete a minimum of three payments using online bill pay OR have one direct deposit of $300 or more to their account within 45 days of account opening. Bonus will be deposited into their account within 75 days of account opening after meeting the qualifications. Account must be open at the time the bonus is paid and must remain open for a minimum of 12 months. If the account is closed within 12 months, Associated Bank reserves the right to deduct the monetary bonus from the account prior to closing. Customers with an Associated Bank checking account in the last six months, joint owners on an existing Associated Bank checking account and Associated Bank colleagues are not eligible. Popmoney® and transfers to external accounts do not qualify for the required transactions to receive the monetary bonus. Exclusions apply. Primary owner on the account must be 18 years or older to qualify. Offer limited to one per household, cannot be combined with other offers and is subject to change (at Associated Bank’s discretion) at any time without notice. For tax reporting purposes, a 1099 may be issued at year-end for the year in which the bonus is given. 2. Offer expires December 31, 2018. A minimum opening deposit of $10,000 is required to receive the bonus and at least such amount must remain on deposit for 90 days to receive the bonus. Deposits from existing accounts do not qualify; funds must be from outside of Associated Bank. $100 bonus will be deposited into money market accounts within 120 days of account opening. Account must be open at the time the bonus is paid and must remain open for a minimum of 12 months. If the account is closed within 12 months, Associated Bank reserves the right to deduct the monetary bonus from the account prior to closing. Primary owner on the account must be 18 years or older to qualify. Offer not available to households who already have or have had a money market account at Associated Bank within the last six months. Associated Bank colleagues are not eligible. Offer limited to one per household, cannot be combined with other offers and is subject to change (at Associated Bank’s discretion) at any time without notice. For tax reporting purposes, a 1099 may be issued at year-end for the year in which the bonus is given. 3. Offer subject to credit approval and applies to the Brewers Visa® Bonus Rewards Credit Card. $25 cash back will be awarded in the form of 2,500 bonus rewards points after first purchase. First purchase bonus points will be applied six to eight weeks after first purchase and are not awarded for balance transfers or cash advances. Reward points can be redeemed as a cash deposit to a checking or savings account with this Financial Institution only within seven business days or as a statement credit to your credit card account within one to two billing cycles. Monthly net purchases bonus points will be applied each billing cycle. Net purchases are purchases minus credits and returns. The Elan Rewards program is subject to change. Points expire five years from the end of the quarter in which they are earned. The creditor and issuer of these cards is Elan Financial Services, pursuant to a license from Visa U.S.A. Inc.
4. Show your Brewers card or checks when making a purchase or entering the Associated Bank Check In Gate. You must have a valid Brewers game day ticket to enter the stadium. You and your party can enter through the Associated Bank Check in Gate at all Brewers home games. Exclusions may apply, please see a store associate for details. 5. Tickets for valid game dates can be purchased online with valid coupon code or at the Brewers Box Office when you show your card or checks. All trademarks, service marks, and trade names referenced in the material are official trademarks and the property of their respective owners. Associated Bank, N.A. Member FDIC.